Yogurt is a perfect toddler food since it’s packed with calcium, protein, vitamin D, and probiotics to help little bodies stay strong and healthy. But the market for kid-specific yogurt has exploded over the past few years, so it can be overwhelming to choose one at the store. I’m always reading the labels to see just what’s inside those colorful containers covered with images of Elsa and Grover. In all honestly, it took my daughter a while to like yogurt. I relied on plain, whole milk yogurt either on its own or with a little jam or fruit puree stirred in, and she was lukewarm about it for many months. 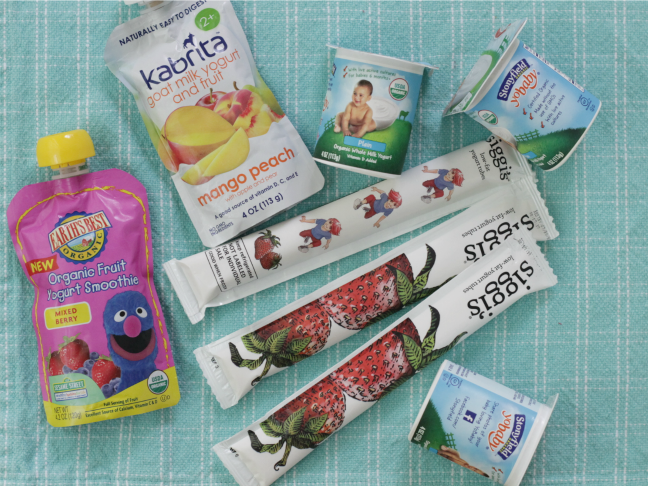 Her turning point came when Siggi’s introduced their kid pouches—she adored them immediately! And for me, finally finding a brand that didn’t add a whopping dose of sugar was a big relief since I knew she was getting the nutrition I was after, with a flavor that she really liked. Over a year later, she’ll now happily eat plain yogurt topped with granola and a drizzle of honey at least once a week for breakfast. I still buy the Siggi’s tubes on occasion when I can find them. But to be honest, I try to only buy them when they are on sale since they can be a little spendy—so I compiled a list of other yogurts with good nutritional profiles with flavors that toddlers like. Keep in mind that a four-ounce serving of plain whole milk yogurt has five grams of sugar from the natural sugars in milk, so anything on top of that is added either in the form of cane sugar (usually) or fruit. And many of the tubes are only two ounces, so do the math if your kid will be eating more than one. In our house, yogurt is a snack, not a treat, so I opt for the lowest added sugar varieties that I can find. I’m all for enjoying sweet treats in moderation, but when something is marketed as a wholesome snack, that’s what I’d like it to be. 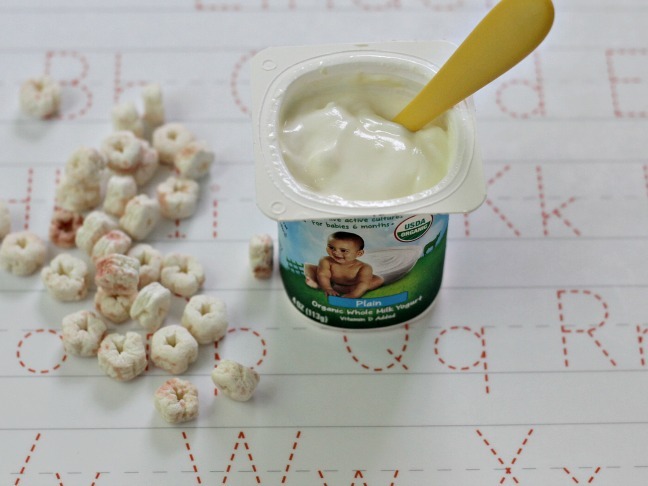 Here are the 5 best yogurts for toddlers on the market today. Stonyfield Plain Whole Milk YoBaby: This is my favorite yogurt since it tastes delicious—it’s not too tangy but it’s super creamy—it’s organic, so it’s free from any questionable hormones, and it doesn’t have any added sugar. They make flavored varieties which your toddler may prefer, but most have double (or more) the sugar from both fruit and cane sugar. For younger toddlers especially, I’d opt for plain and stir in a little fruit puree if needed. Siggi’s Yogurt Tubes: These yogurt tubes are high in protein and low in added sugar, like all of Siggi’s yogurts. The style is similar to Greek yogurt, and they have a subtle fruit flavor. Each tube is only two ounces, though, so my daughter tends to want two at a time. I like that they have at least two grams less sugar per tube than every other tube I’ve compared them with. They are made with low-fat milk, so if your toddler is under two, make sure they are getting fats for brain development elsewhere in their diet. Kabrita Goat Milk Yogurt and Fruit: We found this pouch on a recent Whole Foods trip, and I love that it’s sweetened with just fruit and that the goat milk base might be easier for some little tummies to digest. The four-ounce package is a nice size for a snack, and it’s really convenient for toddlers to eat. Earth’s Best Fruit Yogurt Smoothie: These pouches were a go-to travel food during the year that my daughter was one (let’s not discuss the one time she squirted the contents of one all over me!). They are naturally sweetened with fruit, and they have a mild flavor that kids seem to enjoy. Plus, the Sesame Street characters are pretty fun! And if you’re looking for a way to save some money and still feed your toddler delicious and healthy yogurt, try a reusable pouch like Resqueeze or Little Green Pouch. Paired with a regular carton of plain yogurt and a little whole-fruit jam or fruit puree, this will always cost less than portion-sized ones, and it will taste pretty great too. Both brands are easy to clean and are really durable, so you can use them again and again.